There are two species of weasels in Alaska: the Short-tailed Weasel or Ermine (Mustela erminea) and the Least Weasel (Mustela rixosa). These weasels range over North America and are found throughout most of Alaska. Neither weasel is found on the offshore islands of the Bering Sea or the Aleutian Islands west of Unimak Island. In addition, the Least Weasel does not occur on the Kodiak Archipelago or on most islands in Southeast Alaska. The Short-tailed Weasel occurs in the Old World where it is known by the name of "stoat." These furbearers are the smallest members of the family Mustelidae. Other species of mustelids in Alaska include mink, marten, river otter, sea otter, and wolverine. Weasels are more common than most people realize. Because they are small, they usually pass unnoticed unless caught in a trap or revealed by their tracks in fresh snow. Weasel tracks resemble those of the larger mink. They generally show four toe prints. The little toe seldom shows except in fresh snow or mud. Each weasel footprint is oval-shaped. In the snow, a single footprint will measure approximately 1 inch (2.5 cm) in length and slightly less in width. The front feet of a running weasel strike the ground before the hind feet. Usually, one of the front feet falls slightly ahead of the other. The hind feet usually land in the tracks made by the front feet. Thus, the trail often appears as pairs of slightly offset prints. The distance between sets of prints is approximately 13 inches (33 cm). In summer, both weasels are medium to dark brown above, with yellowish white underparts. Both species turn white in winter. The larger of the two is the Short-tailed species. It can reach 15 inches (38 cm) in length and 7 ounces (198 g) in weight. The Least Weasel well deserves its title of the smallest living carnivore. It reaches a maximum length of 10 inches (25 cm) and a weight of 3 ounces (85 g). The Short-tailed Weasel's tail is one-fourth to one-third of the total body length while the Least Weasel's tail length comprises only about 15 percent of total body length. During all seasons the tip of the Short-tailed Weasel's tail is black. The tail of the Least Weasel contains only a few black hairs. Long slender skulls and sinuous bodies equip the weasel for its niche in life. If the head can fit into a burrow, then the remainder of the body can easily fit as well. Weasels are powerful animals for their size. A weasel is capable of running 300 yards (274 m) while carrying a large mouse in its mouth. In both species the males are about 25 percent larger than females. Weasels are primarily solitary animals except during the mating and whelping seasons. Reproductive pairing is usually temporary. Females may be bred by more than one male. Mating typically occurs in mid- to late summer. Fertilization of the ova is followed by a period during which the eggs do not implant in the uterus. No development occurs during this period. This process is called delayed implantation. After 6 to 7 months the fertilized ova implant in the uterus and embryos begin to develop. The total gestation span is 8 to 10 months. Least Weasels apparently do not always experience delayed implantation. In the southern portion of their geographic range they can produce three litters per year. In Alaska, litters of 3 to 10 young are born from early May through June. Variations in time of breeding and birth depend in part on the latitude. Weasels in northern Alaska breed about two weeks later than those in the south. Weasels usually nest in small rodent burrows, stumps, rock outcroppings, or under old buildings. The nest is often lined with mouse fur. The number of young born and the number that survive until weaning depend in large part on the abundance of food in the mother's home range. Young weasels remain in the den for 30 to 45 days, at which time they are about two-thirds grown. After emerging, they stay near the home den for a week or two before beginning to accompany their mother on foraging trips. At 80 to 85 days of age (early fall) they reach full size. At this time, they disperse away from their mother's home range. Sexual maturity is reached by the following spring. The presence of weasels is almost always indicative of substantial rodent populations. Weasels must have almost daily access to rodents in order to survive. They prefer mice. 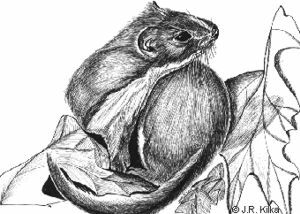 When mice are not abundant, weasels will also take shrews, pikas, birds, fish, and insects. Short-tailed Weasels can also kill young snowshoe hares. Weasels have a high metabolic rate which drives them in search of prey. They eat 40 percent or more of their body weight daily. During the whelping period, female weasels kill and consume an average of four mice per day. Their fast and furious pace allows only short periods of inactivity. Total daily rest time averages a few hours. Weasels hunt both at night and during the day. They locate prey chiefly by scent. Weasels typically pounce on their prey with their forefeet. They kill with bites to the back of the neck. They occasionally emit a shriek when seizing prey. Nature seldom provides a steady source of food. The weasel's mode of survival involves killing whatever it can, whenever it can. When confronted with an abundance of mice, the voracious weasel follows the only pattern it knows and will kill more than it can eat at one time. Dens often have a side chamber used as a store room for surplus slain mice. Weasels use forested, brushy, and open country. On the Arctic Slope and in the plateau areas they primarily live in areas of geographic relief such as slopes, rock slides, and stream banks. Weasels typically do not occur in wet sedge or grass meadows. However, they will move into the lowlands during the peak portion of lemming cycles. Most weasel activity occurs at or near ground level. However, weasels will occasionally climb trees. Short-tailed Weasels have home ranges up to 40 acres (16 ha). They have been known to travel over three miles (5 km). On the other hand, Least Weasels move less extensively. They normally have home ranges of a few acres (1-2 ha) in size. Population densities of 20 weasels per square mile (7.8/km2) have been recorded. However, less than 10 per square mile (3.9/km2) is more typical under good habitat conditions. As with most predators, fluctuations in prey numbers create corresponding variations in weasel numbers. Weasel trails may appear quite erratic. However, weasels have definite movement patterns. They return again and again to forage the same familiar routes. Even the worst of the weather doesn't seem to deter weasels from their required rounds. They have been observed under the coldest and stormiest conditions traveling over the bleakest and most exposed ranges. Weasels have few natural enemies of significance except possibly the horned owl and marten. Both species are apparently agile enough to occasionally catch weasels. Hawks, foxes, coyotes, and lynx also kill weasels, but such occurrences are rare. Speed, ferocity, and the ability to fit into tight spaces help the weasel to cope with these larger predators. A weasel's annual color changes also provide natural camouflage. The weasel benefits both as the hunter and as the hunted. In winter, a potential predator may only see the black tip of the tail moving against the white snow. If the predator strikes at this black spot, it will miss the weasel's body. As a last resort, weasels can emit an odor which is as pungent as that of a striped skunk. Weasels are persistent and fearless hunters. They will boldly confront animals much larger than themselves. They've been known to attack humans who come between them and their food. A severe winter with insufficient food is doubtless their worst enemy. The Short-tailed Weasel's pure white winter fur is sometimes called ermine. For centuries, Ermine fur has been used as trim on parkas and on other clothing. Historically in western societies, the fur was considered to be a badge of royalty. Weasels are only of minor economic importance as furbearers in Alaska. Weasels are typically taken incidentally in traps set for other furbearers. In Alaska, significant numbers of weasel pelts enter the commercial fur market only when prices are high. For the past several years, a relatively insignificant 300-500 Ermine pelts per year have been traded.